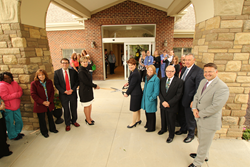 On Sunday, May 15, Rockynol Retirement Community dedicated its new $11.5 million, 64-room assisted living center. We are excited to offer these new luxurious accommodations to our residents. This project allows us to continue as Akron’s leading premier choice for first-class assisted living. On Sunday, May 15, Rockynol Retirement Community, a not-for-profit continuing care retirement community, dedicated its new $11.5 million, 64-room assisted living center. After 18 months of construction, the new state-of-the-art structure was dedicated at an invitation-only ceremony and ribbon cutting. The new building provides the latest in assisted living amenities and services, offering six different studio and three one-bedroom floor plans. These apartment-style residences include kitchenettes and walk-in showers. The center also offers delicious cooked-to-order meals with full-service restaurant-style dining. Over 20 comfortable common areas invite residents out of their apartments to meet new people, socialize and have fun. Designed by JMM Architects and built by Welty Building Company of Fairlawn, Ohio, the beautiful exterior of the center was inspired by surrounding neighborhood homes. In addition to the deluxe accommodations, the new assisted living center will continue to respond to residents’ needs. Whether it’s managing medications or providing increasing personal needs like grooming and bathing assistance, Rockynol’s assisted living services are tailored to each resident. Rockynol is one of 12 retirement communities owned and operated by OPRS Communities, a wholly owned subsidiary of Ohio Presbyterian Retirement Services (OPRS), headquartered in Columbus. Since 1922, OPRS has defined the highest standards of quality of life for older adults. Each year, OPRS serves more than 73,000 people annually through its wholly owned subsidiaries OPRS Communities and Senior Independence.